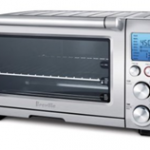 Breville BOV800XL Smart Oven is the perfect partner for your cooking needs. It is a good investment for those who are so into cooking different kinds of food that would require different methods of heating. What sets it apart from the other ovens is that it does not only guarantee an equal distribution of heat all throughout, it actually adjust its heat distribution depending on the food type you put in it. Have you been looking for the oven that won’t let you down? Don’t you wish ovens were a lot more reliable than the usual ones you can get in stores? Then no question about it, Breville Smart Oven is what you have been waiting for! Breville BOV800XL has a non stick interior at 0.8 cubic feet. This can accommodate not just the regular-sized pans but also 13 –inch pizzas, plus you need not worry about food sticking on to the inside of the oven because of its non-stick feature. It offers three different three rack positions. You can choose the distance you want the food will be from the heating elements. This is really useful so that certain foods don’t have to be too near the heat if not needed. Five quartz are used as heating elements. Each piece of the quartz has power that can be adjusted according to the preference of the user. This smart oven by Breville has a LCD that has blue back light. The screen is so user-friendly that the blue light becomes orange when it is in the pre-heating stage. This gives you the idea of what it’s doing by just looking at the color of the light. It comes with IQ Technology, the element that gives the user control. On the LCD screen, you will see nine different pre-set functions, designed for various types of food. There’s an option for toast and bagel which you can press if you need the oven for bread. Because the oven is powerful, it can broil and roast as well as it can do pizza and make cookies. And like most ovens, it can do the simple task of reheating and keeping food stuff warm. Breville BOV800XL measures 18.5 inches by 16.25 inches by 11.25 inches. This is big enough for you to do six slices of pizza at a time and even a thirteen -inch family size one. This could also mean you can put in plates of food instead of dealing with them batch by batch. Breville Smart Oven does not come on its own in the box. There are some accessories that will make your experience with this amazing oven even better. In the box will also be a crumb tray that you can remove and replace anytime. This makes cleaning it so easy. To be placed on the rack are pizza pan and baking pan. You don’t have to make do with whatever pan is available as each has a different purpose. If you want to broil something, you can use the broil rack. The best part of all is the wire rack that you can automatically eject. Breville BOV800XL gives the owner total control in many things. Unlike ordinary ones, this oven does not have an “all or nothing” capacity. Instead of just a dial from 1 to 6, Breville Smart Oven has a user-friendly LCD screen that clearly displays the pre-set functions with the specific food name. Have you had the experience of baking something and the oven burned the toppings but left the stuffing uncooked? You will not have this kind of problem with this Breville oven. Because of its IQ Element, the heat is spread evenly to parts of the food where it is mostly needed. Plus you can control the temperature of the quartz to match the food you place in the oven. Cleaning will be a piece of cake. You won’t worry about crumbs getting into the heating elements because it comes with a crumb tray that can easily be taken out after using. Because Breville BOV800XL is such a powerful oven, it requires much energy. It is not advisable to have another piece of appliance share an electrical outlet with it. You might also have to ensure that you have a 20 amps breaker in the outlet that you use as it requires about 18 to 20 amps to function. It is also important to note that the power cord is not that long, shorter than 3 feet. 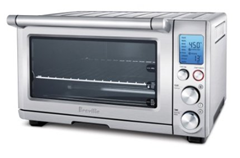 This Breville Smart Oven is best placed on a counter top near an electrical socket. It is user-friendly. You cannot go wrong with it with the help of its LCD screen that comprehensively states the different pre-set functions. You can make a variety food with it. Aside from reheating left-overs, you can also roast and broil. And this is made easier with the accessories that come with the oven. Keeping food warm is so easy. You just pop it in and press “warm” on the control panel. The oven is big enough to accommodate more than a 12-inch pizza, so you can put in more than six slices at a time. It is very easy to clean. With the non-stick interior and crumb tray, there is not much to do but wipe the exterior clean. However, despite the long list of good stuff, there are complaints of it occupying too much space because of its size. The issue of having to secure an extension wire with a breaker is not that uncommon also. Others also find the Breville BOV800XL a bit too pricey for an oven. From its original price of $299.99, you can now keep your $50.04 because you can now grab the Breville Smart Oven for only $249.95.